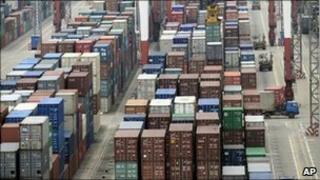 The US trade deficit ballooned in 2010 by the largest amount seen in a decade, Commerce Department figures have shown. The trade deficit - the difference between imports and exports - hit $497.8bn (£311bn) last year, up 32.8% on the year before, the biggest annual percentage gain since 2000. Imports from China hit record levels, totalling $364.9bn for the year. For the month of December, the deficit widened by 5.9% to $40.6bn, after a rise in the price for imported oil. This rise was also a factor in the widening annual deficit, with the average price of imported oil increasing from $56.93 a barrel in 2009 to $74.66 in 2010. In 2009, the deficit had fallen to an eight-year low after a drop in imports. But that was reversed in 2010, as overall US imports of goods and services grew 19.7% to $2.33 trillion, indicating that US consumers and businesses spent more as the economy picked up. Exports increased by 16.6% to $1.83tn for the year. If the US can maintain this rate of growth in exports, it will reach President Obama's goal of doubling exports between 2010 and 2015. The closely-watched trade deficit with China rose by 20.4% to an all-time high of $273.1bn, the largest imbalance the US has recorded with a single country. Chinese imports far outweighed the $91.9bn worth of US exports going the other way. Critics in the US have accused Beijing of manipulating its currency to gain unfair trade advantages and of creating barriers to keep US goods out.